Got a couple of ripe bananas sitting on the bench? 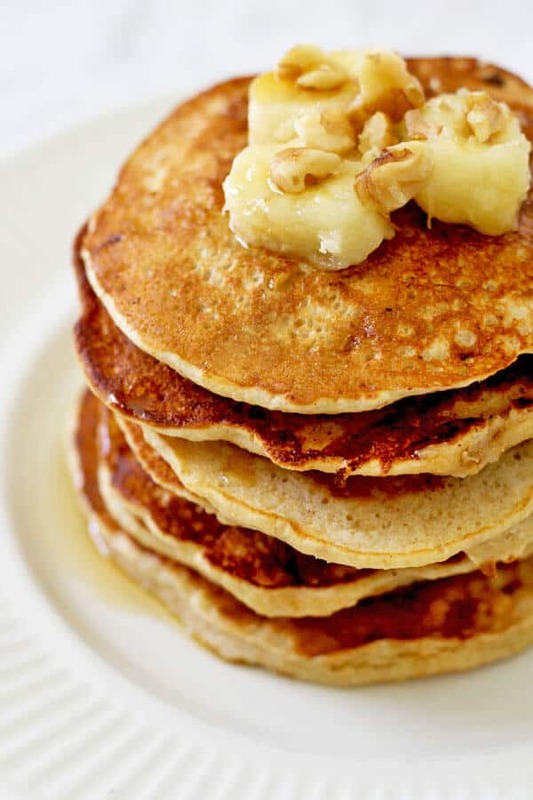 Make these Healthy Banana Pancakes! 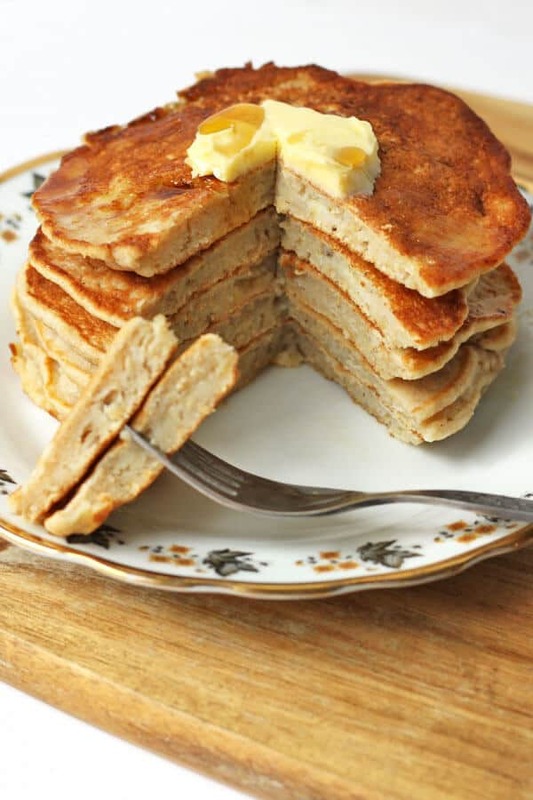 These sugar free, whole grain pancakes are simple to prepare, fluffy and oh so tasty. Finish them off with your favourite toppings. When it comes to universally loved breakfast foods, pancakes surely take the cake. Is there anything more satisfying than polishing off a plate of pancakes with lashing of butter and copious amounts of maple syrup? I don’t believe there is. 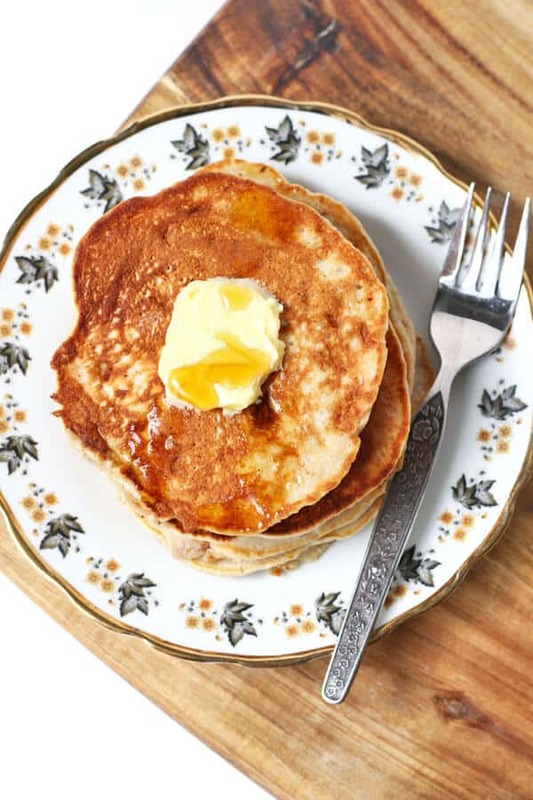 Growing up I recall many Sunday mornings spent devouring a stack of buttermilk shaker bottle pancakes (you know the ones). Granted they were always delicious, but the very concept of shaker bottle pancakes seems strange to me now. Whipping up a pancake batter takes less than 5 minutes and is made of everyday ingredients. Why would you possibly need to make that process simpler? Needless to say, these days I make my pancakes from scratch. And when I do, I ALWAYS make these Healthy Banana Pancakes. I can’t be the only person in the world who thinks of that Jack Johnson song every time I eat banana pancakes, right?! Actually I think the songs been responsible for making me want to eat banana pancakes. A bit of a chicken or the egg situation, if you will. These healthy banana pancakes are a blank canvas, so you can jazz them up as you wish (jazz? am I 90?). Feeling choc chips? Throw them in. Love peanut butter and can’t live a morning without it? Slather that pancake with PB and enjoy. I’m not here to tell you how to eat your pancake. I’m not some kind of pancake police. I’m just here to tell you these healthy banana pancakes are where it’s at! 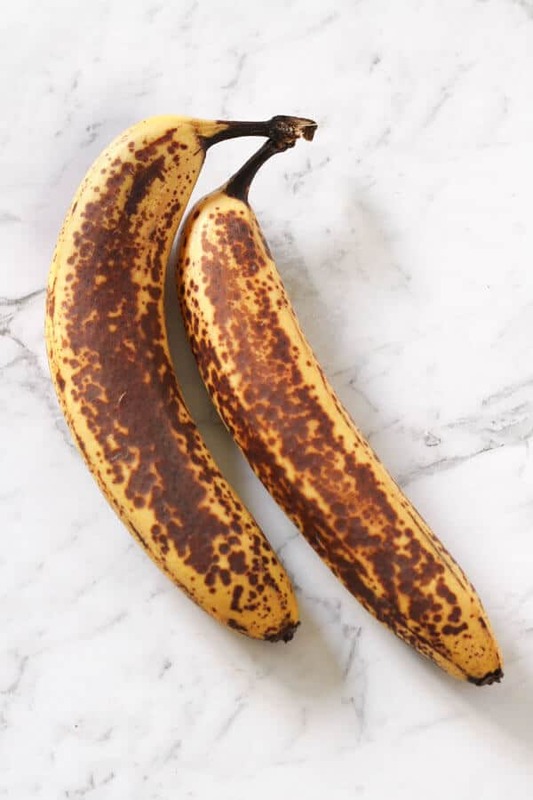 Ripe Bananas – the darker and uglier, the better. Whole Wheat / Wholemeal Flour – OR you can use white all purpose flour if you’d prefer. Milk – Use whichever milk you have on hand. I’ve tried with cows, almond and soy and all worked perfectly. Butter – OR you can use olive oil or coconut oil if you’d prefer. You can easily add in blueberries or chocolate chips to the batter before you cook the pancakes if you’d like. Caramelised Banana Slices (get the recipe here). First, mash bananas on a small plate or bowl and put aside (photo 1). Next, mix the dry ingredients (flour, baking powder, salt and cinnamon) in a large mixing bowl and stir to combine (photo 2). In a seperate bowl, mix the liquid ingredients (egg, milk and vanilla) and stir to combine (photo 3). Add liquid mixture to the dry mixture and stir well to ensure all ingredients are combined (photo 4). Fold in mashed banana (photo 5). Heat frying pan on medium-low and grease with your choice of butter or oil. Add 3 tbsps. of mixture to the pan and allow pancake to cook fully on both sides, approximately 2 minutes each side. Whilst the mixture may not bubble as with traditional pancakes, the sides will become golden which can be used as a guide of when to flip. Repeat until the mixture is gone, adding more butter and oil to the pan in-between pancakes when needed (photo 6). The mixture will yield at least 6 pancakes. Serve immediately, cover with your favourite toppings and enjoy! If you’ve got any pancakes leftover, store in an airtight container in the fridge for up to 3 days. When you’re ready to enjoy, reheat in the microwave, 30 seconds at a time, until hot throughout. If you’ve tried these Healthy Banana Pancakes I’d love to hear how you enjoyed them! Pop a comment and a star rating below! You can also FOLLOW ME on FACEBOOK, INSTAGRAM and PINTEREST to keep up to date with more delicious recipes. Mash bananas on a small plate or bowl and put aside. Add dry ingredients (flour, baking powder, salt and cinnamon) in a large mixing bowl and stir to combine. In a seperate bowl, mix the wet ingredients (egg, milk and vanilla) and stir to combine. Add liquid mixture with dry mixture and stir well to ensure all ingredients are combined. Fold in mashed banana. Heat frying pan on medium-low and grease with butter. Add 3 tbsps. of mixture to the pan and allow pancake to cook fully on both sides, approximately 2 minutes each side. Whilst the mixture may not bubble as with traditional pancakes, the sides will become golden which can be used as a guide of when to flip. Repeat until the mixture is gone, adding more butter to the pan in-between batches when needed. Serve immediately with your favourite toppings and enjoy! Whole Wheat / Wholemeal Flour - You can use white all purpose flour if you'd prefer. Milk - Use whichever milk you have on hand. I've tried with cows, almond and soy and all worked perfectly. Butter - You can use olive oil or coconut oil if you'd prefer. STORING - Store any leftovers in an airtight container in the fridge for 3 days. Reheat in the microwave in 30 seconds blocks until heated through. Last Updated: March 25, 2019 – no changes to the recipe, just updated with more photos, tips and tricks. I love anything with bananas – banana bread, banana cake – and now this banana pancakes. I would love to try it for breakfast, it might be perfect paired with a cup of hot choco. Paired with a hot chocolate – delicious! Thanks lovely 🙂 It was so hot here yesterday! 33 I think – I’m melting!! I’ve never made or eaten Banana pancakes before, but they sound yummy! I would love to try these sometime. Love this recipe! It makes me want to play Jack Johnson in the mornings! I can hardly tell the difference! I need to make these for sure! Pancakes are a staple in our house in the mornings. I really love the taste of banana pancakes. They are truly one of my favorites. 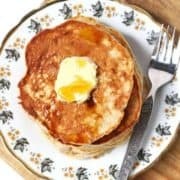 I definitely would like to make these pancakes with gluten-free flour and see how they turn out! I would top them with strawberries or blueberries and real maple syrup from local producers here in Maine. I also add bananas to smoothies everyday! Sounds perfect Karen! We bought some real maple syrup in Vermont on our New England trip last year – oh my gosh, so delicious! Banana pancakes are so so good! I really like banana anything so I want to try making these asap! Yum! Our family loves bananas and pancakes so this would be a perfect breakfast meal. Adding to our weekly meal plan! I used to think pancakes were an indulgence until I started making them at home and realized I could create healthy versions. I love adding bananas to my pancakes, or pumpkin puree. It makes them taste so delicious. Healthy pancakes are where it’s at! Wow! These sound so amazing! I will definitely give them a try as my kids will LOVE them…Pinned!!! I love pancakes but always thought they were too unhealthy to enjoy too often. But I’m so happy to have found this recipe! I love babanas and would love to try these pancakes with chocolate chips. Chocolate and banana together is just heaven! I was craving pancakes so badly yesterday and went to my favorite cafe. Now, that I have your recipe and it includes healthy bananas I am going to use this and eat from home! Oh yeh! Hope you enjoy! These look delicious! 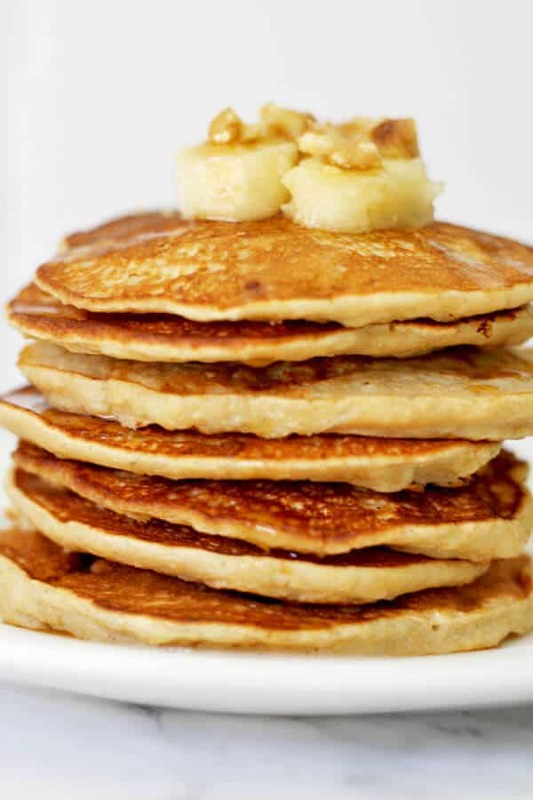 I love bananas and pancakes and so do my kids so I’d have to try this recipe sometime! I love banana pancakes. These look so fluffy and much prettier than mine usually turn out. I will have to try this recipe. Believe me – when I’m just eating them, they don’t look pretty at all! My daughter eats a banana every morning for breakfast. These would be a nice change for her! Your daughter and I would be great friends 🙂 Bananas forever! Looks just delicious! Thanks for making them healthy too! Oh yum, is there a way to make these with some type of cinnamon drops? Would it still be healthy? What are cinnamon drops lovely? Haven’t heard of them! Yummm! Banana pancakes are my favorite and I am definitely going to try out your recipe. Thanks for sharing! yum! i havent tried pancakes with banana but this looks amazing! These sound so delicious! I need to give them a try. I love how easy it would be to make them ahead of time. Comes together so quickly Reesa! I can’t get enough bananas either! Btw – a vegan sub for eggs is banana, so I put them in every pancake! HAHAHA. These look delicious! I tried to do this and it’s so delicious and healthy. My kids really love it. Especially, with honey and butter. You had me at “Healthy” and the recipe sounds easy enough for me to tackle. I’m all about keeping in simple Shannon! That banana pancake looks absolutely delish. With pancakes, you can mix just about anything to it and it’s easy to make too. I never thought of putting peanut butter on my pancakes. Sounds very interesting! I’ve done these before. My kids didn’t think they’d like it, but they loved it!! Thanks. This is such a great, simple recipe for some really yummy-looking pancakes! Our oldest daughter has been scared to try pancakes for years—she’s an interesting one ;)—but she’s been reading books and gearing herself up to try them. I may have to use this recipe—I love the simple ingredients and the use of banana! Nawww that’s adorable that she’s gearing herself up to try them! I reckon she’ll figure out pretty quickly that they are delicious! I love pancakes! They are a favorite in our home! I especially love when I can make them healthy. Did you just say healthy and pancakes in the same sentence? Oh my you can count me in, these banana pancakes look delicious! Pancakes are definitely one of my favorite breakfasts! Just this morning I was thinking I wish there was McDonald’s nearby because I’m in a rush and in the mood for pancakes! My mom used to make something similar for my dad, he loves them! By the way, the Queensland slogan couldn’t be more perfect! Oh man, I used to get McDonald’s pancakes for breakfast on my birthday growing up – they will always hold a special place in my heart. You had me at healthy, and pancakes. I’m all in on this one, sounds amazing and looks yummy! Bananas are such a perfect flavor for breakfast. And in pancakes, what a combo.. so much yum! I used to make these all the time!! And I think I need to start making these pancakes again!! I think my son would love them! I’m sure your son would love them too! Oh, I love banana very much! Banana cakes, banana bread, banana pudding.. and now: banana pancake! Sure I’ll try this! Great looking recipe..always need new breakfast one will have to try this weekend! Easy and healthy? I am so game for this recipe especially since the kids go crazy for pancakes. I’d love to customize this from time to time, some chocolate chips will brighten anyone’s day! Who wouldn’t love a pancake filled with choc chips haha! So yum! Love making banana pancakes for the kiddos. These look so good! These banana pancakes look so delicious and easy to make. I am always looking for healthier options to feed my family. I will have to give this recipe a try on the weekend. Nothing says the perfect breakfast to me than pancakes! I love that you’ve offered up a healthy version of my favorite. Such a classic delicious breakfast option! I love banana pancakes. I would love to try this healthy version because they look amazing. I love a good pancake breakfast, but now I am gluten free, so I am having to reinvent myself. I know there is a good banana pancake out there for this gal. Of course Terri! What kinds of flours do you use? I am SO going to make this recipe one of these days. I love pancakes and a healthier version is always welcome. I hope you get some good weather out there. We eat pancakes for brinner almost every week. I have never made banana pancakes before, but I think my family would love them. Brinner is where it’s at! Oh pancakes are my favorite breakfast, substitute to rice. Adding it with bacon, honey and more bananas, and fresh brewed coffee. Bacon – now that’s an idea! I don’t think I’ve ever had banana pancakes! I’d like to try them. They look yummy! They add natural sweetness and I love biting into a chunk! I am adding this to my must try board. I am trying so hard to eat healthier and it is things like pancakes that get me in trouble! These look delicious. Since we have been trying to move on to healthier meal choices, looks like this one will be added to our list to try out. My boys love pancakes. I need to make these for them. I’m sure they’d love them! I love anything with bananas, I just got into chia so I will try that shake too. My son has been asking for pancakes so I will have to make this for him, they look so good. Chia seeds are so good! I try and throw them in everything! this is one of our favourite breakfasts. my kids absolutely love this. Mm, sounds tasty! I love bananas, and I have been trying to incorporate more healthy recipes into our meals. It’s so simple to do! I love this recipe! It took me a few times to get the consistency of the pancakes right the first time I tried it but I eventually figured it out. It’s nice to have a healthy alternative to my favourite breakfast food! Can’t live a day without banana! For the mix part I usually combine my protein powder and eggs together ‘cus I need my protein intakes in the morning as a fitness junkie. Gotta try this recipe this week! I’ve been interested in experimenting with protein powder in them! These look super good! 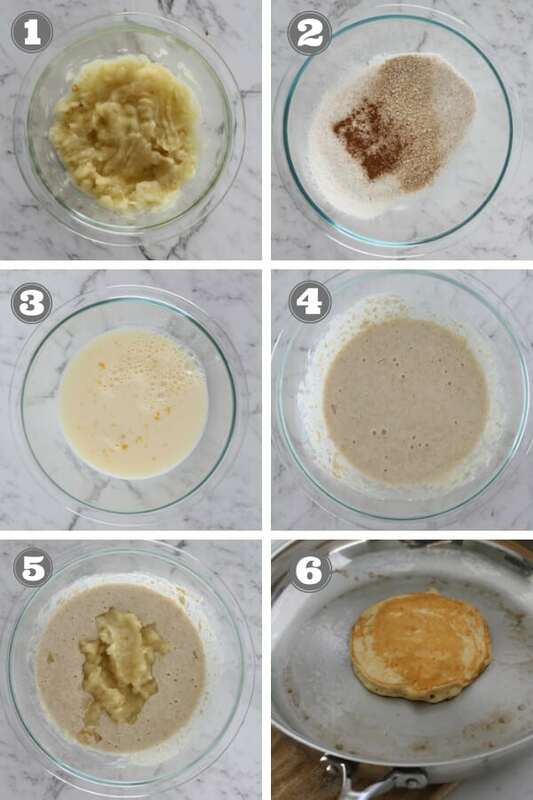 My daughter is always asking for pancakes for breakfast, so I am always looking for ways to make them healthier. I will have to try this recipe out! Hope she enjoys them lovely! I love bananas so now will have to try out these banana pancakes. The steel cut oats recipe looks good too! Those look delicious. Now I know what I want for breakfast tomorrow morning. Hahaha <3. Haha hope you enjoy Danielle! I am so with you. I could eat pancakes all the time, and these look amazing! I love banana pancakes, and I especially love that these are healthy so I can eat a whole stack of them! I haven’t been eating carbs. So I want to reach in through my computer and grab these pancakes. They look delicious! I resolved a long time ago that I can’t live without carbs!